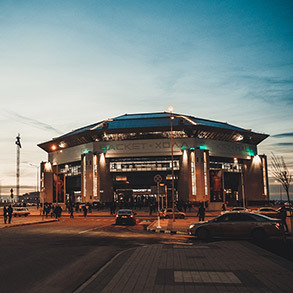 Lokomotiv Kuban home arena opened in 2011. It was a big event for Krasnodar. 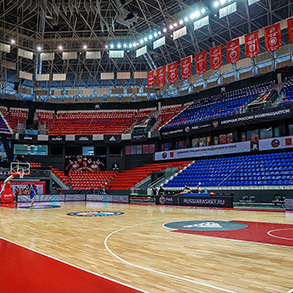 From the very beginning of its operation, the arena was full with spectators – it happened at home game in January 2012. 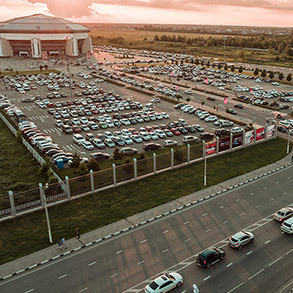 The Krasnodar basketball arena became a true tourist attraction of the city and the region. 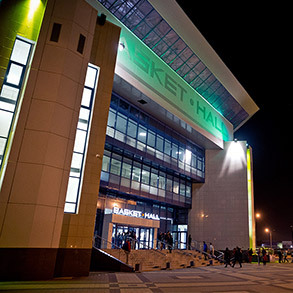 Basket Hall is not only Lokomotiv home arena but also a modern sports complex welcoming various team sports competitions at the highest level. The capacity of the central arena is 7 500 seats. There are comfortable conditions for creating breathtaking fascinating sports show. PSSO sound system is located all around the hall. High quality lightning increases entertainment effect and creates a decent picture for TV broadcasting. HARO parquet is a special pride of Basket Hall – the court meets NBA requirements. A new wide Mondo screen was established in the 2011/2012 season to make basketball an unforgettable event. It is an alternative to traditional information cubes in basketball arenas. Basket Hall has all conditions for athletes’ training and development: on the second floor, there is a gym with telescopic bleachers for 500 seats, as well as training equipment, showers, comfortable locker-rooms. Conditions improvement is still going on. The parking was extended. Fan shops are available for fans. Additional food service areas are being created. Basket Hall was restyled in summer 2016. The interior was painted from white into dark grey. On September 17th, 2016, Basket Hall welcomed the Day of Basketball devoted to the 70th anniversary of PBC Lokomotiv Kuban and the first game of the Russian national team in Krasnodar. In the 18/19 season, we installed a media cube in the Basket Hall arena to make every game an unforgettable event.